The Cub Cadet Snow Blower 930 SWE is the smallest snow blower in the 900 series that Cub Cadet offers for sale. Thirty inches wide with a 357 cc engine, this snow thrower will handle pretty much everything most consumers will throw at it. With standard 22 inch clearing height, 16 inch augers and impeller you will be able to clear all of the snow in your driveway quickly and efficiently. This unit comes with a push button electric starter for easy starting on cold days, remote pitch control and rotational controls for the chute, an in dash headlight and power steering trigger for easier steering on rough surfaces. No more need to try to manhandle the machine, let it do the work for you with a push of a trigger. This feature makes snow clearing so much easier. 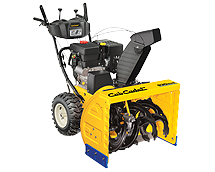 The Cub Cadet Snow Blower 930 SWE also comes with the standard 6 forward and 2 reverse speeds, along with 16 inch traction tires for dealing with all kinds of conditions. A great machine for most consumers. Prior to starting your snowblower the first time each day, perform a quick walk around check of the machine to ensure there are no loose parts and no leaking fluids. Check the engine oil to ensure that it is at the correct level as specified by the manual. Top up if necessary. Fill the fuel tank while the engine is cold and prior to using the machine. If you do spill fuel, wait until it has fully evaporated prior to starting the engine. Never spill fuel on a hot engine to avoid fires. Always fill the fuel tank outdoors to avoid any possibility of vapors going into your house. This seems like an obvious thing but people still do it and are hurt, sometimes badly, every year. Always turn it off before you do any maintenance. This includes adding fuel, check the oil, fix the chains on the tires, or clear the augers of snow. Clearing Snow from the Augers – this is were lots of people are hurt every year. Before you try to clear snow that is plugging the augers, shut the engine off. It avoids sudden turning of the augers or the impeller which could cause lots of damage to fingers, hands and arms. Use Snow Clearing Tool – This is the really important part. You have plugged the augers with snow, you have shut the machine off and now you are trying to clear the snow away. Never place your hands inside the augers to get at the snow. Use a broom handle if you have an old machine. Or use the snow clearing tool that came with your newer machine to clear the snow. You can also purchase these tools from most stores as an extra if you break yours or if you have an older machine which does not have one. This is the safe way to clear snow from around the augers and the impeller. Sometimes the snow is so compacted, it allows the augers to turn as a result of built up tension in the pulley mechanism. Better to have a broom handle stuck in there than your hands! Like all snow blowers or snow throwers, maintenance is important for your machine to operate at a peak level for many years. Change the engine oil regularly. Check the belts for tightness. Change the spark plug as required and grease any spots outlined in the manual. If you need to leave the snow blower outside all year round, cover the machine. Use a proper cover to keep it looking new and avoid deterioration of the tires and metal components.